A multitude of new applications are possible thanks to the extension of the SKF Explorer heavy-duty RSH sealed deep groove ball bearing range. Benjamin Provoost, product management and marketing, product line deep groove ball bearings, SKF France, Saint-Cyr sur Loire, France. Frederic Briend, product specialist, product line deep groove ball bearings, SKF France, Saint-Cyr sur Loire, France. Enhancements to the SKF Explorer deep groove ball bearing product range with the implementation of the RSH seal for larger bearing sizes extends application possibilities. It means that whether it is an OEM looking for a unique solution, a customer needing an off-the-shelf solution for a standard application or an end user seeking a reliable replacement bearing to fit in, there is a product in the range that is suitable. By meeting the design challenges of heavy-duty sealing for larger bearing sizes, SKF is offering a high-performance product that is also highly competitive. 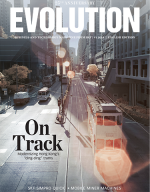 These characteristics lead to significantly longer bearing service life. Fig. 1: The SKF Explorer deep groove ball bearing range with RSH heavy-duty seals has been extended to larger sizes. For OEMs this provides greater reliability, or longer calculated life, or offers the possibility of down-sizing. For end-users the benefits are longer trouble-free machine operation and reduced maintenance costs. 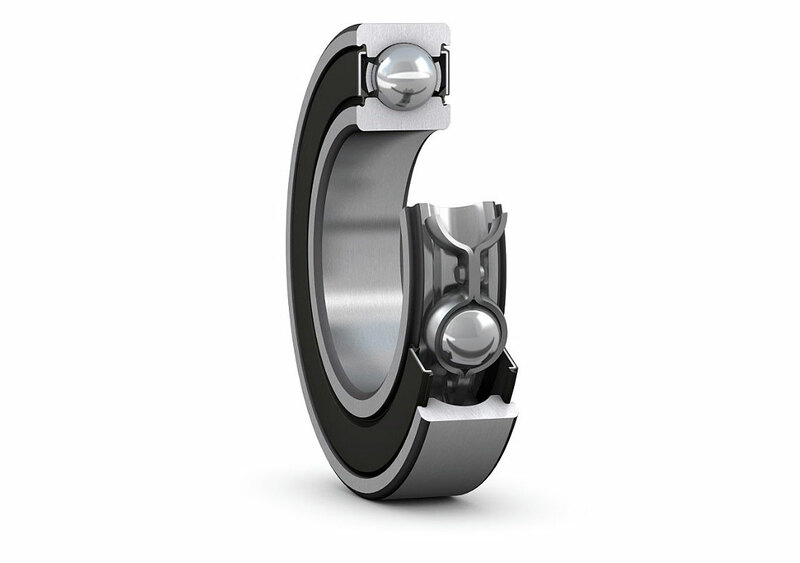 SKF has continuously improved the SKF Explorer deep groove ball bearing range since its introduction. Now it is time for a further advance. The latest development is an extension of the size range of bearings that incorporate SKF’s best-in-class RSH sealing solutions. Fig. 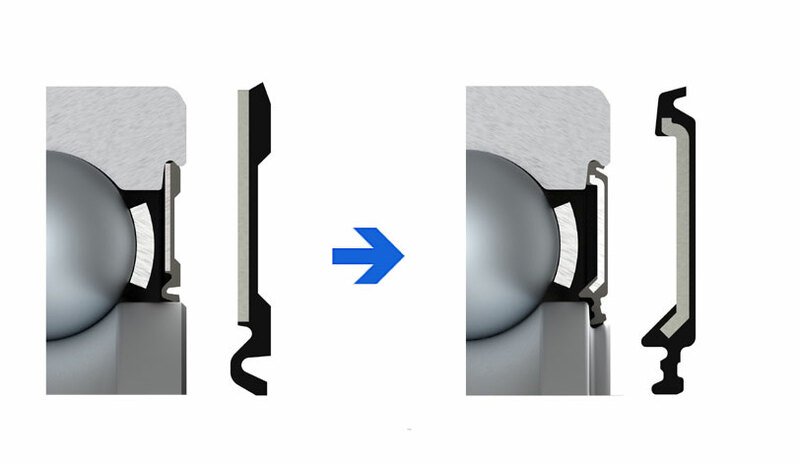 2: (Standard) sealing solutions for SKF Explorer deep groove ball bearings. As already noted, SKF Explorer sealed deep groove ball bearings comprise a large range, suitable for a wide variety of industrial applications (fig. 3). Fig. 3: Extension of RSH sealing availability in SKF Explorer deep groove ball bearing range. Arrows indicate bearings with 2RS1 seals in the 62 and 63 series being replaced by bearings with 2RSH seals. 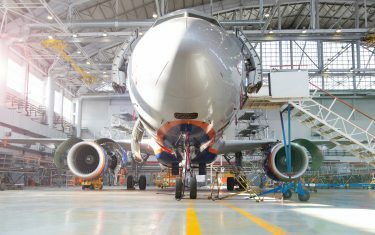 Seals play an important role in extending bearing service life. Factors that contribute to longer service life include good sealing efficiency with contaminant exclusion and grease retention. There is a large demand for equipment able to withstand severe pollution or cleaning constraints. The present SKF RSH ­sealing solution meets this need for bearing sizes in the 60, 62 and 63 series with a bore of up to 25 mm. Increasingly however, there are requirements for this stronger sealing solution to be available for larger sizes. To respond to this need, SKF has extended the range for bearings equipped with RSH seals up to 60 mm bore in both the 62 and 63 series. This extension of the range is beneficial for a multitude of applications and industries. So, applications incorporating larger bearing sizes can now benefit from longer maintenance intervals and greater resistance to contam­inants thanks to the extension of the RSH seal range to these bearings. The result is bearings that last longer, especially in wet, contaminated or dusty operating conditions, and that need to be replaced less frequently. Fig. 4: For the bearing sizes stated in fig. 3, the RSH seal is replacing the RS1 seal. The RSH heavy-duty seals replace the RS1 seals currently used. Fig. 4 shows the difference between the two seal designs. The lip of the RS1 seal makes radial contact with the outer diameter of the inner ring. With the RSH seal, the lip of the seal is in contact axially with the inner ring in a groove at the side and incorporates a secondary lip seal that can withstand high-pressure cleaning and prevents water entry. In this seal design, the contact pressure between this seal lip and the seal counterface increases when pressure is applied to the outside of the bearing, while the lip design itself prevents the seal from being pressed into the bearing. In addition, seals have radial slots in the tapered attachment. These provide the contact area between the seal lip and counterface with proper lubrication so enabling the grease to act as a third protection. Fig. 5: Impact of axial interference on sealing efficiency. 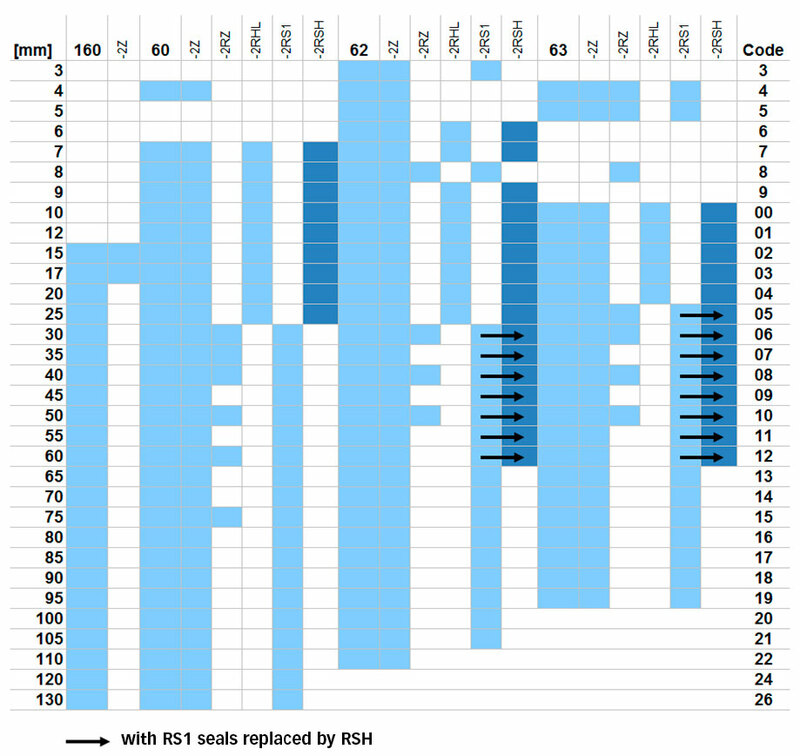 Adapting the tried and tested RSH seal for larger bearing sizes did present new challenges for the design of the axial sealing of this dual-lip design. Sealing efficiency is directly linked to contact pressure due to the interference of the lip with the rotating part, the bearing inner ring. Clearly, there must be contact, though friction should remain as low as possible. Fig. 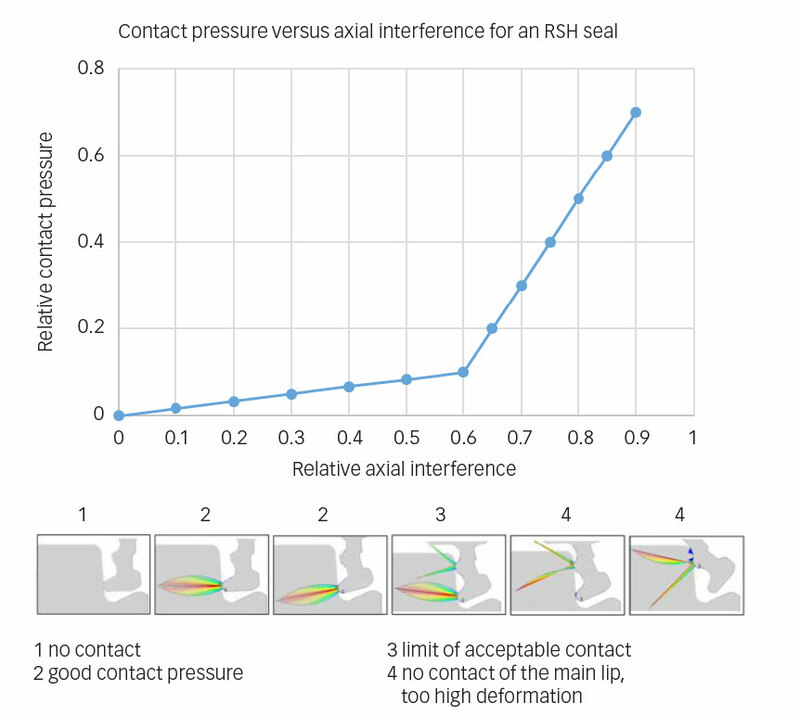 5 shows the impact of axial interference on contact pressure. 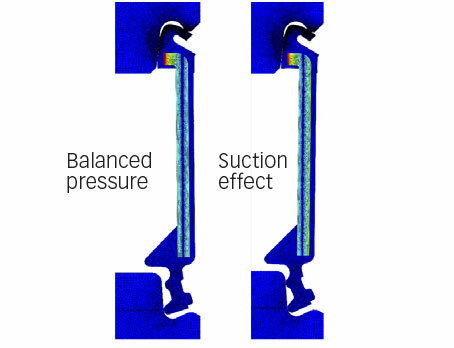 Under axial load conditions (fig. 6) the rings of a deep groove ball bearing move relatively to each other. In larger bearing sizes it is possible to have an axial displacement of the rings of around half a millimetre. Consequently, on the load side of the inner ring, this leads to decreasing contact interference. A worst-case scenario is reached when there is no more contact and, therefore, no effective sealing. Also on the opposite side, the contact interference increases and could deform the seal lip to prevent normal working conditions. To maintain effective sealing, it is important that neither situation occurs under operating conditions. Fig. 6: Influence of axial loads on the sealing system. For axial seals, the interference is linked to the manufacturing tolerances of the bearing rings and seals as well as to the axial clearance of the bearing and axial load conditions. In larger bearing sizes, one challenge is that the possible axial clearance of the bearing is being increased, while also increasing manufacturing tolerances (fig. 7). Additionally, too much pressure at the anchorage point leads to seal deformation and causes an umbrella effect. 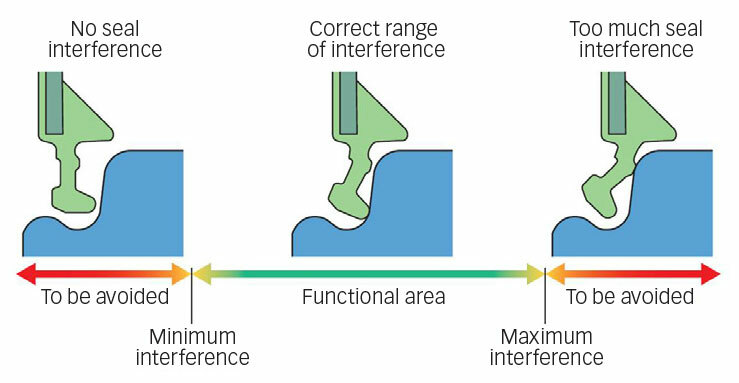 An umbrella effect impacts interference adversely. Too little pressure at the anchorage point leads to seal slippage and grease leakage, especially when the outer ring is rotating. 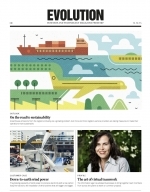 SKF has optimized its RSH anchorage to remain in the normal working condition zone. Fig. 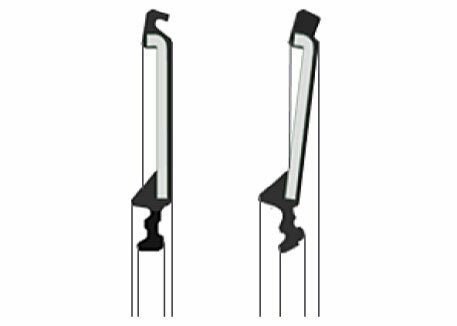 8 shows the difference between SKF (left) and other manufacturers’ (right) anchorage designs with an umbrella effect. Fig. 7: Influence of manufacturing tolerances. The RSH seal is made from acrylo-nitrile-butadiene rubber that has an operating temperature range from –40 to +100 oC and up to 120 oC for short periods. This material has less sensitivity to ageing. Ageing leads to harder rubber and less lip flexibility that can lead to quicker lip wear and loss of sealing efficiency. In addition the material is tested to be compatible with SKF’s standard lubricants. Fig. 8: The impact of anchorage design on seal umbrella effect. In some applications, bearings operate at rather high temperatures. 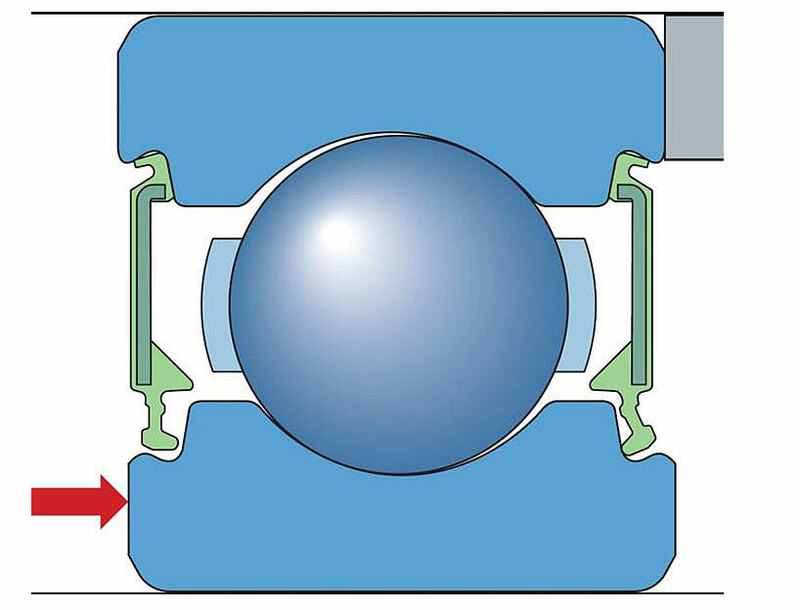 When the machine is stopped and cools down, the air inside the bearing creates a suction effect that could lead to blocking the bearing rotation when restarting, because the contact pressure of the lip against the inner ring recess is too high (fig. 9). For these larger bearing sizes, the RSH seals have optimized vent holes, to eliminate the risk of a vacuum effect caused by low internal pressure – and do so without compromising sealing efficiency. The vent holes keep the pressure from inside and outside the bearing balanced. The vent holes may create an entrance for pollution or an exit for grease. This is where the optimization is important, and SKF has succeeded in optimizing this to a higher degree than competitor designs. Combined with the redesign of the seal groove in the outer ring of the bearing, both of these developments contribute to longer bearing service life. Fig. 9: Effect of temperature differences without vent holes. 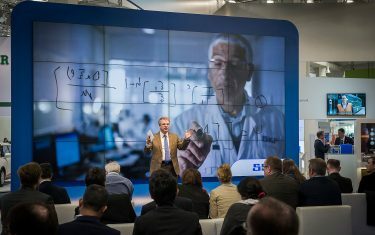 In conclusion, SKF is making the RSH best-in-class sealing solution available to 15 additional sizes to complement the current 25 within the SKF Explorer deep groove ball bearing range. Customers who use the larger bearing sizes can now achieve cost benefits as the RSH seal helps reduce the frequency and cost of repair, as this seal is optimized for highly contaminated environments. Such improved sealing brings greater reliability to equipment. Alongside the improved seals, SKF is offering also a large range of available greases that further add to the customization possibilities. This is coupled with the additional benefit of optimized grease filling to avoid grease leakage issues. 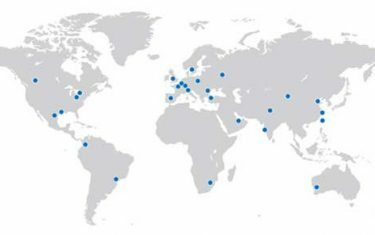 The SKF Explorer deep groove ball bearing is a global product that is extremely versatile and can meet the needs of all types of customers. With a standard product, time to market can be shortened and, in operation, maintenance and inventory costs can be reduced. The continual enhancement of the SKF Explorer deep groove ball bearing range through higher-performance sealing solutions that offer better exclusion against contaminants sets new standards for an already premium product.